Once you have set up an experiment and created your variations, you are ready to set up your different document versions to test. Let's say that you want to do an A/B test on a call-to-action button on your homepage. You want to compare two different wordings for the button. Your base wording is "Test it out," and you want to compare this to "Create a project." Select your homepage document from your document list, and edit the button text. Save this version and select to "Publish it during an experiment variation..."
You will then be prompted to select which variation you want this to be put on. You can select from any variation you have previously created or choose to create a new variation. 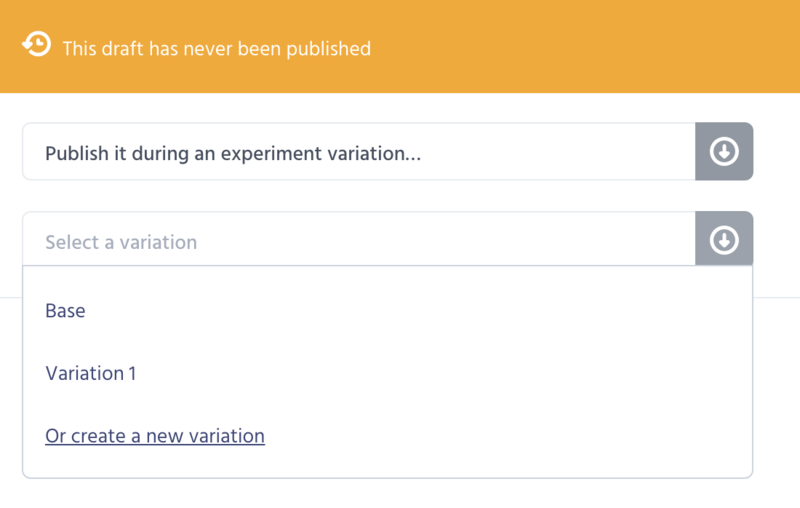 Once you've created your experiment versions, your different variations will automatically be distributed to different users and you will begin to collect data. Return to the Experiment page. When you select any of your variations, you will be able to see the list of documents and the the changes they contain. If you want to edit a document in your variation, you can just click on the document in the diff screen and it will take you to the document edit screen. Make your changes and re-publish to the experiment variation. You can create as many variations as you need for your experiment. Simply go through all these steps again to set up another variation. Once your experiment is launched, an experiment will be created in your google analytics account and you will be able to configure advanced settings there.